By Glenn P. Edwards Jr. Recently it was reported that Facebook had a vulnerability which allowed you to send an executable file via Facebook messaging. Can you think of a person that you know that doesn’t have a Facebook account, or at least someone you know that does have one? Scary isn’t it? The researchers who brought this to attention add to the recent waves of public disclosure showing there’s a trend amongst large companies putting security second. Is it absolutely necessary to send attachments via Facebook or is it just a bloated feature which will do more harm than good? Will most users tamper with the HTTP POST and alter the data being sent to trick a user? Not your everyday user, but for a pentest/red team/nation states of course. It doesn’t matter anyway because Facebook fixed it and we are all safe, right? I figured I should first start out by verifying that we can’t simply modify the HTTP POST content as previously disclosed. Capture the HTTP POST content - Once logged into Facebook, I fired up the Tamper Data add-on and choose to tamper the request made when you choose to upload a file via Facebook messaging. Alright… so maybe Facebook is doing another check on the backend to verify that the file extension, content type and file header (if available) match. Well I’m a nosey/curious person so let’s test it out. Have you ever heard of Right-to-Left-Override (RTLO)? 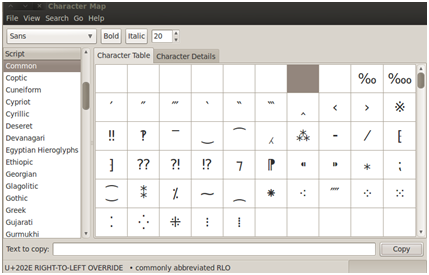 RTLO is Unicode character (U+202E) and exists to support languages which are written from right to left such as Arabic and Hebrew. While RTLO is among the most commonly known there are similar characters such as the Left-to-Right-Overide (LTRO) Unicode character which is what I’ll use in the following example. Most people are still unaware of such characters but using them is a technique that’s been observed with malware in order to depict a false sense of what the file actually is. As you can see from above, if you search for “U+202E” you’ll land on the RTLO Unicode character, same thing for “U+202D”. After it was scanned only 58% (most popular companies found it) detected it as something questionable. – side rant… why isn’t fuzzy hashing incorporated into A/V ?? anyone? Code re-use isn’t hard to detect and helps find variants people. Let’s get back to Facebook and try to attach it within a message. After capturing the HTTP POST content again I noticed that the ‘Content-Type’ field states it’s a ‘text/plain’ file but if you notice towards the end it still found the file’s header “MZ”. Below is the victim’s Facebook inbox to show that the message was in fact transmitted and successfully received by the victim. There’s no actual checking of the contents of the file – as we know from opening this file up within a hex editor that the file header is clearly there and identifiable. It’s understandable for a company like Facebook to say solely sending a file isn’t what leads to a compromise – there’s some social engineering and user interaction which must take place. However, they’re not helping…. and when someone says they’ve fixed something, don’t always believe them until you can verify it for yourself. Glenn P. Edwards Jr. is a Senior Consultant with Foundstone’s Incident Response practice where he specializes in Digital Forensics, Malware Analysis and Intrusion Detection. To clear a few things up – this was meant as a PoC that you could still attach an executable file to a Facebook message and try to see what types of checks/scanning of attachments Facebook was actually doing. Since the particular example I showed alters the file type, the file _should_ execute with the default application to handle that file extension (i.e. since Windows thinks it’s a Text Document, notepad or whatever is set for that file extension on the target system will try opening the file.). With that being said, I don’t believe this to downgrade its potential but just something to note. The previous researchers showed adding a space to the end of the EXE and sending the file – what is unknown is when that file is downloaded by the victim how the file name appears. Based on what I observed, it should be intact and if that’s the case then Windows shouldn’t recognize what type of file it is because it has an unknown/invalid file extension which means it too wouldn’t execute right away either without having its name modified. There are other possibilities that weren’t tried such as just doing a RTLO and changing the icon/resource section of the EXE. By doing this, it would still appear as an application but again look like something else but the only difference is how the system would handle that particular file type. Awesome post (that's a pun, get it?) and ingenuity on your part. I bet you could have gotten away with generating a msfpayload and encoding it a dozen times and saving it as a PDF...and their A/V scanner still wouldn't have caught it, but still let you upload it. I have tried generating payloads and encoding the with shinkata_ga_nai 12+ times, and bypassed popular A/V detection. The LTRO/RTLO is cool, but it seems a bit more complicated than necessary. "They aren’t really scanning attachment files or they aren’t using one of the popular A/V programs that originally flagged this file as questionable "
So here is a funny thing. I was curious about your above conclusion and thought to test it out myself. So I download the EICAR test files(a .com version and .com.txt version), sure enough AV on my machine complained and deleted the files( I tried this with two different AVs). When I tried to send the .com.txt version of EICAR to a friend Facebook did not complain at all but when I tried using the .com version facebook gave me an error. So considering that the AV on my machine was able to catch both the .txt and .com.txt versions, it makes me wonder why facebook wont catch the .txt.com version. Awesome article! I had presented the original - rectified - exploit in a presentation last week. This better version gives some more insight and tells us that however safe a website claims to be, it is never 100% safe. What happens if you just put an exe on a web server and send a bit.ly URL? before posting? It's the polite thing to do. The basis of the vulnerability was already disclosed publicly and Facebook was aware of it. What happens if you put the LTRO on the end of the file name? e.g. "foobar.exe(LTRO)"